7.85 points at 66 votes (rank 119). Sounds scary, doesn't it? That's what it is. A demon has kidnapped the knight's, that is your, girl. So he gets started to free her. The demon doesn't look at it deedlessly, but he sends all kinds of gloomy creatures towards him: zombies, ghosts, demons and even shooting carnivores. You need to fight yourself through four rather different levels, which are each devided into two parts. The passage from one part to the next is guarded by a weaker demon (death bird), which needs to be defeated with three hits. To get to a higher level, you need to defeat a strong demon (Ork or dragon), which guards the key to the door. At the end awaits you as a guard of the girl a big Chinese dragon. Further game elements are new weapons, that you find in your search, as well as the time limit (2:59 minutes) which needs to be kept in every level. If the knight is hit by an enemy, he will lose its armour. Now he is invulnerable for a few seconds, but then the next hit will kill him fully and the current part must be started again. In 1986 the popular game "Ghosts'N Goblins" appeared in the amusement arcades. 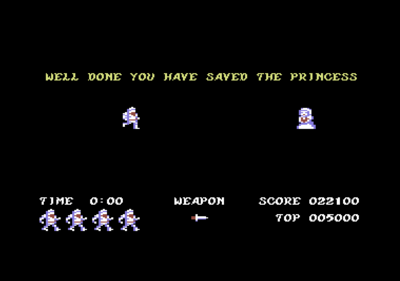 In this game you guided Sir Arthur the knight through seven sideways-scrolling levels by jumping and throwing weapons. In the same year of its arcade release, the game was ported to the C64 by the company Elite; Chris Butler was responsible for the conversion. 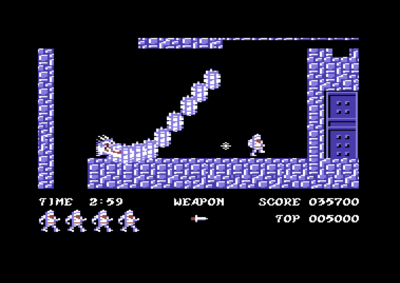 Of the original's seven levels, the C64 features only four; this is because Elite - which had contracted the conversion to Chris Butler - insisted that the game should be run completely from memory without having to reload from media. 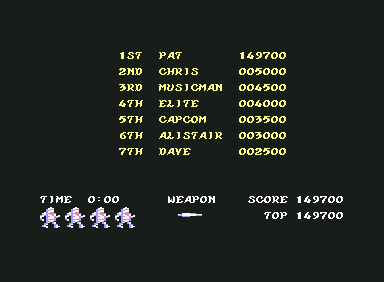 So the first four levels of the arcade model were converted into the C64 version. The order of the third and fourth levels were changed because the cave was more appropriate as a final level than the fire bridge (number four in the original). Chris Butler was an expert C64 game programmer, which has been proven by his later work. The graphics are nice to look at and there are no weak spots to be found in the gameplay. The music was composed by Mark Cooksey, who wrote some of the most popular pieces of music for the C64. 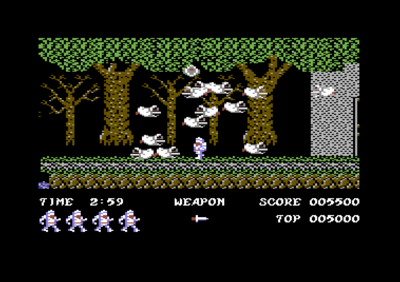 Not for nothing is Ghosts'N Goblins one of the most popular C64 games, even to the present day. 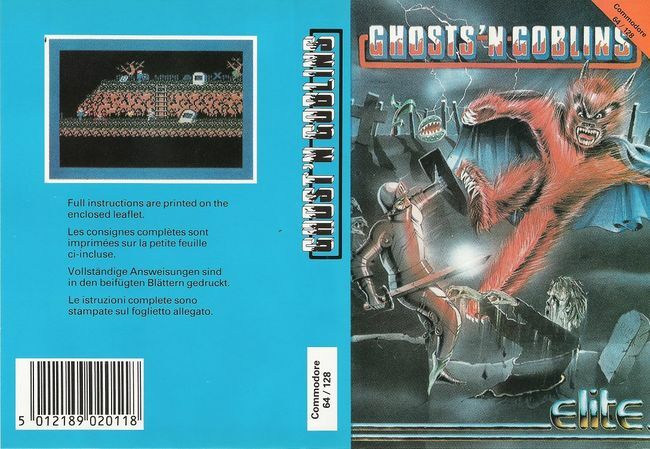 Three years later the successor "Ghouls 'n Ghosts" was converted for the C64; unfortunately, it did not compare to its great forerunner, although it was more extensive than the original. The game "Ghosts'n Goblins" has a 2-D screen with fluent scrolling through the whole level. Very good animated sprites and music, which fits very well to the game, also elaborate graphics. Underground labyrinth and demon castle. Each of the eight parts is several screens long, and some even a few screens high. Following weapons are appeared (in the right senquence): Lance, fire torch, sword, axe and shield. 5 lives, weapon lance and for each level a time of 2:59 minutes. The game is only over by losing all lifes. If you end successfull the level 4 with lifes, you restart the nightmare with level 1 again. In the clay jugs, that are carried by the zombies and other enemies, you can find extras such as bonus points in shape of moneybags or weapons. The zombies, the carnivores, vampires, flying ice crystals, knights or pigs, as well as bats can be destroyed with each one shot, the death bird, giants or shooting pillar with at least three shots and the guard of the gate with at least five shots. Often, more shots are needed for the enemies with higher strength! Watch out for the windows in the ghost town! The weapons, that fly straight are the better ones, i.e. lance, knife and shield. The shield is the best weapon! The safe position by fighting against the final boss Giant in Level 1. 14 enemies in a level part (last part of Level 1). The final boss chinese Dragon in the last Level (Level 4). A screenshoot of the final animation ... after that the nightmare begins again! 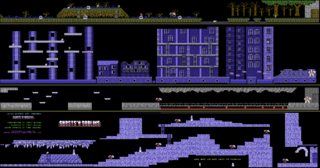 Ghosts'n Goblins Maps (Level 1-4). When facing the last enemy, the collision query of your own character is defect, if you place yourself directly to the right of the gate. This results in your character not being able to get hit by hostile shots. POKE 7086,07 -- Zombies dissolve. POKE 7086,06 -- Zombies disappear into the ground. POKE 7086,03 -- Zombies turn into birds after a few seconds. POKE 7086,01 -- Zombies turn into plants. POKE 7086,19 -- Zombies turn into Superman. Sledgie: "The games is very quick and requires skill and a great deal of patience from the player." Denni: "I found it very hard. But it was quite fun anyway." Jodigi: It is really a difficult, exciting game, where I needed a lot of practice. In spite of that, the C64 version is not very good, especially as the machine version contains many more levels, therefore a small devaluation. Guybrush: "It was damn tricky, but maybe exactly because of this massive difficulty it was so popular. 8 points from me." MontyMole: "In contrast to most of the arcade conversions it has aged very well. The C64 version is self-contained enough to be fun still today, despite the now available arcade version." o.b./TRSi: "This game was one of the few exceptions of arcade conversions: it was at least as good as the machine version." MrBug: "Diese schräge Orgelmusik, die werde ich wohl nie vergessen. Und die Umsetzung der Arcadeversion für den C64 war gut. Nie unfair aber doch sehr schwierig. War ein wirklich gutes Game"
Blubarju: "Graphics and sound are great. The controls are also ok, but why do such games always have to be so hard (at least for me)? Anyway, 8 points from me." The original game name in Japanese is "Makaimura" (魔界村). Modify enemies like blond zombies, canary birds and punks. Knight sprite is partly glitches. The knight Arthur ofters died. Modify enemies, e.g. zombies in Ghouls 'n Ghosts design. Titel screen of Ghost'n Goblins 1994. 1. Level of Ghost'n Goblins 1994. Rather a crazy trainer as a mod! Hacks like: , enemies (and also the platforms), different properties of zombies and carnivorous plants. 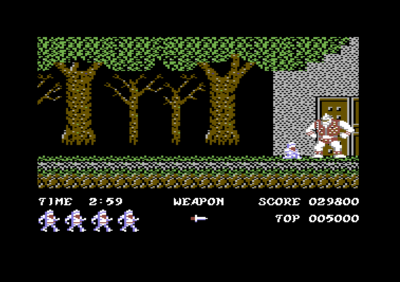 2015 - "Ghosts'n Goblins Arcade / Nostalgia"
The original arcade game with all complete 8 levels was developed as fan project for the C64 by the group Nostalgia in 2015. Intro of "Ghost'n Goblins Arcade". 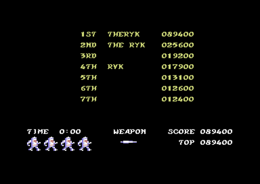 Titel screen of "Ghost'n Goblins Arcade". The level map of "Ghost'n Goblins Arcade". Titel screen of the constructions set. 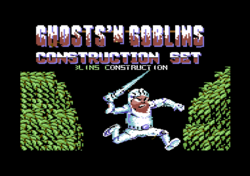 In the year 1986 the group Nova Software House or Nutcrackers developed the Ghosts'n Goblins Construction Set for editing own, modify levels. 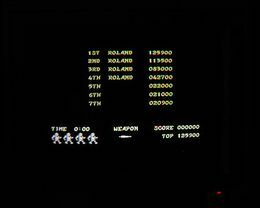 CRSR : Scrolling the cursor (patter) throught the level. STOP : Exit construction set to BASIC. Ghosts'n Goblins in the Killer List Of Videogames. This page was last modified on 5 June 2018, at 03:29.